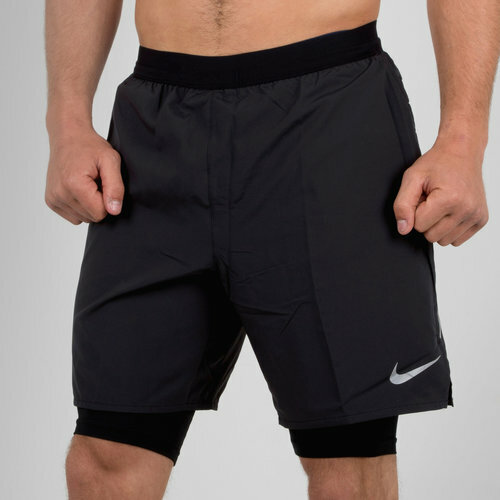 Built for freedom, experience unrestricted movement whilst training at high intensity with the Nike Flex 2 In 1 7 Inch Distance Running Shorts in Black. These polyester running shorts have been designed with 2 layers, the underneath stretch fabric completes the lightweight and comfortable design, providing full range of movement for all those high-intensity movements whether hitting the gym or training field. The Dri-Fit fabric is 100% polyester, which utilises breathability to provide comfort and performance. Hand pockets on either side give the wearer space for practicality when not training.